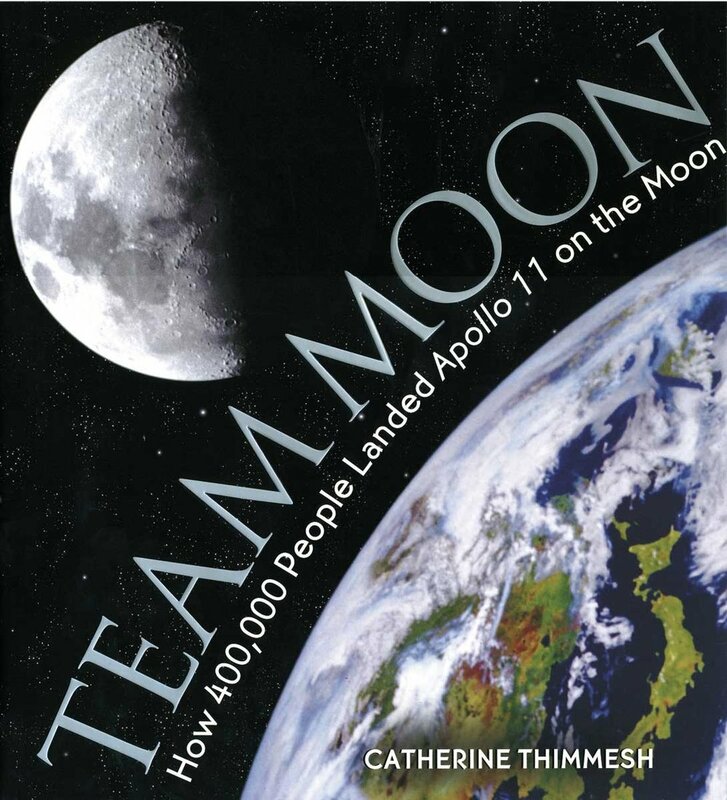 Team Moon: How 400,000 People Landed Apollo 11 on the Moon, by Catherine Thimmesh. Houghton Mifflin, 2006. As newlyweds in 1969, my bride and I watched the moon landing along with billions of earth's citizens. Sadly, it was perhaps the last time most of us seemed to be pulling together for one main objective. We immortalized the astronauts Armstrong, Aldrin, and Collins, but do we remember Eleanor Foracker, Tom Sanzone, or Kirby Hinson as being equally essential to the mission? This book gives homage to Foracker, who sewed the space suits; to Sanzone, who designed the life-supporting portable space packs, and to Hinson, who designed the parachute recovery system necessary for a safe return to earth. These individuals and many others-some 400,000 professionals-made up Team Moon and ensured the success of the moon landing. Although the book may be focused toward children, the text and appealing photographs should satisfy all age groups. The author states that she could pull only a handful of players "from the bench of the best team ever," but still, it is enough to deliver the message of the book. Kudos to Catherine Thimmesh for remembering the players on Team Moon and dedicating the time to document their efforts for all of us to appreciate. This is a thin book, but well assembled and worth you and your children's time to read and enjoy. Catherine Thimmesh took on an enormous mission in researching Team Moon. Devoting time to reading, interviewing, watching videos, listening to tapes, and researching photos, she collected many remarkable stories of those involved in the Apollo 11 effort. Catherine lives in Plymouth, Minnesota, with her husband and two young children. She is the author of Girls Think of Everything: Stories of Ingenious Inventions by Women; The Sky's the Limit: Stories of Discovery by Women and Girls; and Madam President: The True, Extraordinary (and Evolving) Story of Women in Politics. When she isn't writing, Catherine enjoys playing with her kids, reading (new favorite author: Zadie Smith), and traveling (especially to warm locales in the winter). And what started as a lark has now become a passionate hobby; once a week the author can be found hanging upside down and flipping off the flying trapeze at circus school.